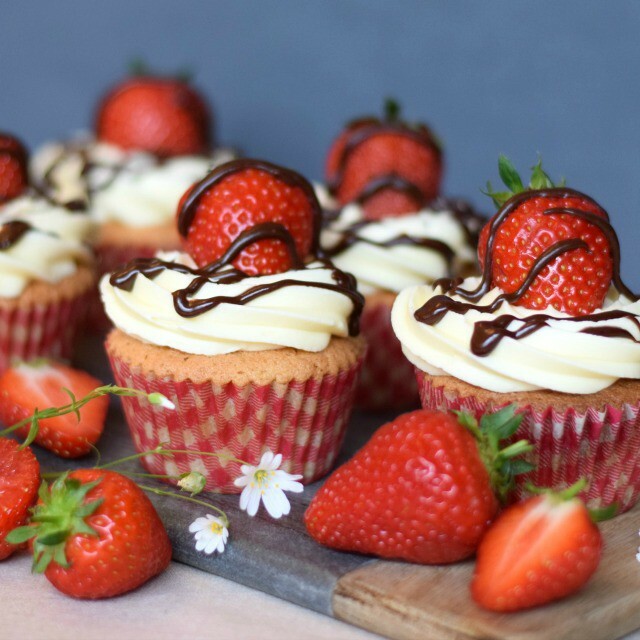 These strawberry cupcakes are a pretty, summery bake. The inviting drizzle of dark chocolate ganache helps to counter the sweetness of the cupcake and buttercream frosting! Summer is almost upon us, though you’d be forgiven for thinking it had already arrived if the glorious weather we’re enjoyed here in the UK is anything to go by. For me, the foods of summer definitely include berries starting with the beautiful red strawberry. I recall the first year that Mr E & I grew some in our small garden, it was fun watching the bees being drawn to the pretty white flowers for them to develop into what we know as strawberries a few short weeks later. But having only a handful of young strawberry plants that year we couldn’t really describe our harvest as ‘bumper’! We just about picked enough to have a couple each with a slice of cake when friends came round for dinner! ? 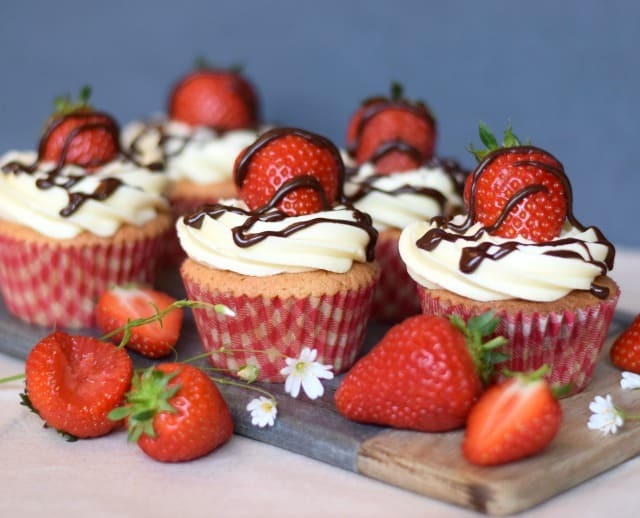 Strawberries are great perched on top of a simple Victoria sponge cupcake. 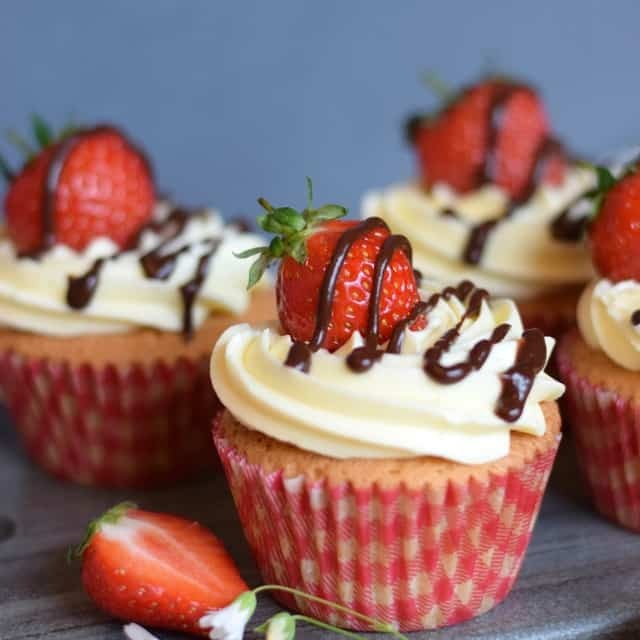 Imagine a soft vanilla cupcake, topped with a simple vanilla buttercream finished with a ripe strawberry and a drizzle of dark chocolate ganache! I don’t know about you, but it certainly sings summer to me. Even Dad found them enticing being pretty quick in grabbing a few tea plates from the cupboard so we could all dive in and enjoy them! Now, I have to admit that I’m not a huge fan of dark chocolate, much preferring milk and white instead. But the small amount of dark chocolate used was enough to cut through the sweetness of the cupcake and buttercream without the natural bitterness of the dark chocolate becoming too much. Preheat the oven to 190℃ / Fan 170℃ / 375℉ / Gas 5. Place the muffin sized cases into the muffin tray. Place the soft butter and sugar into a good sized bowl and beat together with a wooden spoon or electric beaters until very pale and fluffy. Add the salt and vanilla extract and beat again to combine. Gradually add the beaten egg a little at a time, beating well after each addition, (see note b below). Beat in the milk. Sieve the flour into the mixture. Use a spatula, large metal spoon or your hand with your fingers splayed to fold this in gently. Fill the muffin cases & bake. Using a teaspoon, fill the cases with the batter mixture. You're aiming for them to be half to two-thirds full. You may decide to weigh each muffin to ensure equal sizes. Each will weigh about 63g. Place the muffin tray in the centre of the oven and bake for 20 - 23 minutes. You may need to rotate the tray after 15 minutes of baking. Once baked, remove from the oven and muffin tray and place onto a cooling rack. Pour the cream into a small pan and set over a medium heat. Allow the cream to heat through but avoid letting it boil. Meanwhile break the chocolate into small pieces. Place into a bowl. Pour the heated cream over the chocolate. Use a teaspoon to stir the ganache, gradually the chocolate will melt and the ganache will become smooth. Once the chocolate is completely melted and the ganache is smooth, set aside to cool and firm up. Place the softened butter into a good sized bowl. Beat to ensure it is soft and creamy. Sieve half of the icing sugar into the butter. Use a wooden spoon to combine the two ingredients. Sieve the remaining icing sugar into the bowl and beat to combine. Beat well to create a creamy frosting. Add the vanilla extract mix until well combined. Add a drizzle of milk as necessary until it is the softness you like. .
Once the cupcakes have completely cooled, Spoon the buttercream into a piping bag fitted with a large star nozzle pipe a swirl on top of each cake. Sit a strawberry on top of the buttercream. Spoon the cooled ganache into a piping bag fitted with a small plain nozzle (see note d below). Drizzle the chocolate over each cupcake. 8Enjoy! a) When making the cupcake batter, consider weighing the cracked eggs first to ensure the batter has equal weight of butter, sugar, flour and eggs. Simply weigh the butter, sugar and flour to the same weight as the eggs. Of course the value may be slightly different to the 120g listed in the ingredients above. c) If the chocolate ganache has firmed up a little too much when you're ready to pipe it onto the cupcakes simply warm it through gently until it is the consistency you're happy with. d) Rather than using another disposable piping bag you may prefer to make a small piping cone with greaseproof paper. Alternatively, drizzle the chocolate with a teaspoon. e) Consider adding a handful of freeze dried strawberries to the batter. Or once baked and cooled hollow the cupcakes out slightly and fill with a little strawberry jam before decorating. f) You're likely to have a little ganache left over, this could be used for dipping any remaining strawberries. In an airtight container in a cool place for up to 3 days. These are so pretty, you're right about simply flavoured cupcakes being the best, the drizzle adds enough interest I think. Thankyou, I find that chocolate drizzle very inviting too! It's the same here Helen – raining cats & dogs!! I think you're right they definitely are more appropriate for when the sun shines. Thankyou Anca, the little bit of dark chocolate was lovely with the strawberries and frosting though I'm not a huge fan of it ordinarilly because I find it too intense and can give me headaches.